Toronto, ON – As a Ministerial Panel is due to report on this summer’s last minute revisiting of the Kinder Morgan pipeline and tanker proposal, environmental groups from across Canada today sent MPs a briefing note on the fundamentally flawed review process. 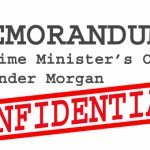 Prepared by Sierra Club BC, Environmental Defence and Équiterre, the document shows the lack of public confidence in the Kinder Morgan process. Restarting the Kinder Morgan review after reforming the NEB is the only viable option. “The NEB review of Kinder Morgan was hopelessly biased towards corporate interests and excluded public participation, environmental impacts and climate change impacts from its deliberations. Unfortunately, despite our high hopes, Prime Minister Trudeau’s ministerial panel had no way to remedy these deficiencies,” said Caitlyn Vernon, Campaigns Director with Sierra Club BC. Environmental groups Sierra Club BC, Environmental Defence and Équiterre sent briefings to all 338 MPs this morning outlining the flaws that plagued the National Energy Board (NEB) review of Kinder Morgan. The briefings also summarized the serious flaws in the Ministerial Panel’s public meetings, which were hastily held this summer to garner additional input from affected communities and First Nations. Without any mandate or formal structure, they ended up just being a place for community members to vent their frustrations with the process and opposition to Kinder Morgan. The panel is due to report to the Minister of Natural Resources this week.